What is Impact Investing ? At Galileo, we dream about future with an abundance of quality jobs and affordable homes for our children - for the next generation. We envision continuous innovation in the delivery of basis services to every individual in environmentally sustainable and thriving world. Imagine a world where investing always targets measurable and positive social and environmental outcomes, in addition to financial returns; a practice that will create a long-lasting impact for future generations. Galileo is promoting a new wave of investments that builds a better world. As defined by the Global Impact Investing Network (GIIN), impact investments are “investments made into companies, organizations and funds with the intention to generate social and environmental impact alongside a financial return”. “The growing impact investment market provides capital to support solutions to the world’s most pressing challenges in sectors such as sustainable agriculture, affordable housing, affordable and accessible healthcare, education, clean technologies and financial services, among many others. Impact measurement – Commitment to measure and report the social and environmental performance and progress of underlying investments in order to ensure transparency and accountability. 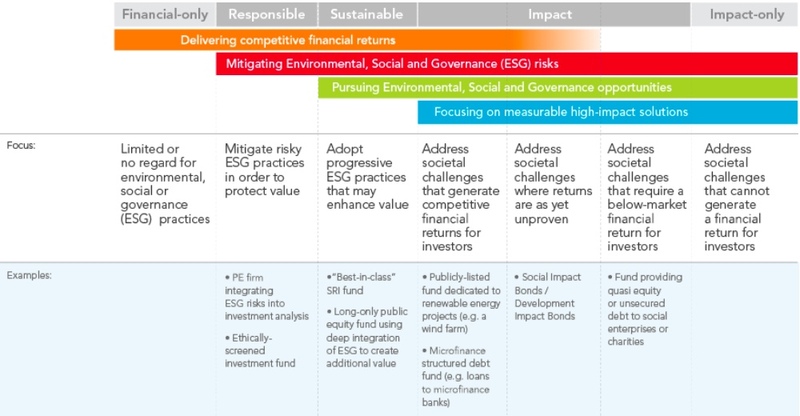 – Mission-related investments (or sustainable investments) which incorporate environmental, social and corporate governance (ESG) criteria into investment analysis and portfolio construction across a range of asset classes and yet do not have an intention to pursue a social or environmental value explicitly. Globally, The overwhelming majority of respondents reported that their investments have either met or exceeded their expectations for both impact (98%) and financial performance (91%) (GIIN, 2017). While two out of three respondents principally target risk-adjusted, market rates of return, there is widespread acknowledgement of the important role played by below-market-rate-seeking capital in the market (GIIN, 2017). Impact investments exists across a wide variety of products, asset classes and sectors. A recent survey forecasts that by 2025 the global impact investment market will be worth $2 trillion (GIIN). On a global scale, impact investments under management were worth about USD 114 billion in May 2017 (GIIN, 2017). After only one year, in May 2018 the amount of money invested in projects with a social or environmental benefit has doubled to USD 228 billion (GIIN,2018). The majority of assets are invested in private debt (24%) and private equity (26%). A significant proportion of these assets are present across financial services, energy, microfinance and housing sectors, with an increasing number of compact investments across the food & agriculture, infrastructure and healthcare sectors recently (GIIN, 2018). On September 25th 2015, 193 Member States of the United Nations adopted a set of goals to end poverty, protect the planet and ensure prosperity for all as part of a new sustainable development agenda. Each goal has specific targets (169 targets in total) to be achieved over the next 15 years. In 2016, the Paris Agreement on climate change entered into force, addressing the need to limit the rise of global temperatures. We are determined to end poverty and hunger, in all their forms and dimensions, and to ensure that all human beings can fulfil their potential in dignity and equality and in a healthy environment. We are determined to foster peaceful, just and inclusive societies which are free from fear and violence. There can be no sustainable development without peace and no peace without sustainable development. The interlinkages and integrated nature of the Sustainable Development Goals are of crucial importance in ensuring that the purpose of the new Agenda is realized. If we realize our ambitions across the full extent of the Agenda, the lives of all will be profoundly improved and our world will be transformed for the better. "The Global Impact Investing Network (GIIN) recognizes the global importance of the UN Sustainable Development Goals. As the world’s largest network of asset owners, asset managers and others involved in directing capital to investments that generate positive social and environmental impact alongside financial returns, the GIIN welcomes the unique role that impact investing will play in achieving these goals and building a sustainable future. We urge all investors to contribute directly to the SDGs’ success. One group in particular is ready to heed the world’s call: impact investors. Many private sector players have been deepening their impact from supporting business models that do less harm (e.g., using ESG principles to filter out businesses hat harm the environment or have poor working conditions) to making impact investments and building businesses that actively deliver solutions to global issues. For years, and in some cases decades, impact investors around the world have been demonstrating the full potential of the private sector to drive progress in areas such as affordable housing, access to financial services, and sustainable energy—impact areas that very clearly line up with SDGs". Please feel free to contact us if you are interested in our events, educational programs for any comments, questions about our services, suggestions, volunteering, partnerships or collaboration at info@iiic.ch or use our online form and we will revert to you. © Copyright 2018 Galileo IIIC. All rights reserved.